As far as the Ranmore War Memorial and St Barnabas Church are concerned, Denbies dates back to the 1850s when the great Victorian builder Thomas Cubitt bought it to build himself a grand country house. Twenty-five years earlier, he had rebuilt nearby Polesden Lacey for the playwright Richard Brinsley Sheridan, so obviously knew and liked the area. When Thomas died in 1855, the Estate passed to his only surviving son George (later lst Lord Ashcombe), and in succession to his descendants Henry, 2nd Lord Ashcombe; Roland, 3rd Lord Ashcombe; and Henry, 4th Lord Ashcombe (who sold it in 1984 to Adrian White, the founder of the present Denbies Wine Estate). 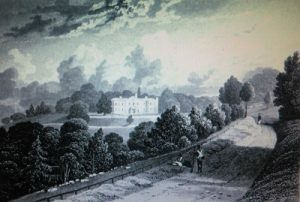 Old engraving, after J.P. Neale, of Denbies House about 1830, showing W.J.Denison’s road snaking up the hill. The Denbies name probably goes back to a farmer called John Denby in 1555. As in most of the Dorking area, his main activity would have been sheep farming. In 1734 Jonathan Tyers, the wealthy owner of Vauxhall Gardens (the exotic, sometimes notorious, London pleasure gardens) bought the Denbies property from a Mr Wakeford, and expanded its farmhouse into a modest Georgian house. In 1806 William Joseph Denison inherited. He set about improving the house, extending the grounds and making a new road to mitigate the steepness of the hill up from Dorking. After his death in 1849, the Estate was bought by Thomas Cubitt. 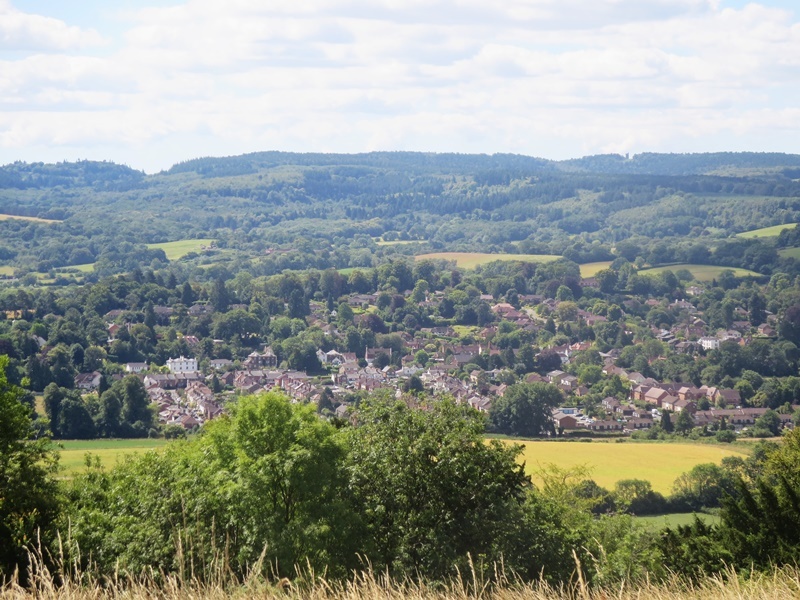 Ranmore Common lies along the 600-foot chalk ridge of the North Downs, with fantastic views in all directions: Leith Hill and the Weald, still magnificent today; and, before the woods grew up, St Paul’s Cathedral and Crystal Palace on a clear day, Windsor Castle on a sunny one. Cubitt decided to build his mansion on almost the same spot as Tyers’ Georgian house, but prudently retained the old building until his new house was ready. He had recently built Osborne House on the Isle of Wight for Queen Victoria and Prince Albert; the Italianate design of Denbies was very similar to Osborne’s East Wing, built in the Cubitt style of “Belgravia” brick-and-stucco. To build such an enormous mansion in a fairly remote rural area was a massive undertaking, but, although in his 60s, the indefatigable Thomas seemed undaunted by the challenge. He could probably live on site in Tyers’ house, and was perhaps assisted in the project by his very capable and trusted foreman George Dines (who subsequently supervised the building of St Barnabas). Quantities of materials were brought by train to Cubitt’s own railway siding by Dorking Town station (now Dorking West), and then were laboriously hauled up the hill by horse and cart. Thomas opened his own brickworks for the project, and the Estate already had kilns to process a notably fine lime from its chalk quarries. Very similar in plan to Osborne and Cubitt’s own house at Clapham Park, Denbies House had projecting bays in the centre of two sides, and a Portland stone balustrade provided balconies to the bedrooms on the first floor. Entering the house through a porte cochere, a visitor passed through the outer and inner halls into all the rooms of such a splendid mansion: two drawing rooms (one leading to the spectacular conservatory), Thomas’s study, a magnificent library, the morning room, a billiard room and the dining room. In all, the Mansion totalled nearly 100 rooms, with a profusion of heavy mahogany furniture, very large pictures (often of cathedrals), and statuary (family and other busts supported on heavy columns). Notable were many tables made of polished flints from the area (an interest of George, 1st Lord Ashcombe, who also collected fossils). Sir Stephen Tallents, George’s grandson, gives a fascinating account of the house interior in “My Grandfather’s House”, a chapter in his autobiography “Man and Boy”. As a small boy, Stephen was particularly impressed by a glass case along a corridor wall containing half the backbone of an iguanadon, a treasure discovered during the sinking of a well at the Sussex house in which George Cubitt installed his youngest daughter Beatrice and her husband William Archibald Calavert: it was not practical at the time to obtain the rest of the backbone without demolishing the well! The Denbies half now resides in Dorking Museum. Many of the rooms had magnificent views over the valley to Dorking and as far as the South Downs. Family bedrooms were on the first floor, nurseries on the second, along with bedrooms for the female servants (well segregated from the male servants who slept on a mezzanine floor above the service wing). Thomas Cubitt insisted on good sanitary arrangements for all the houses he built, but, curiously, there were no bathrooms at Denbies: hip baths were placed in the bedrooms each evening and a can of water carried up to each. Inadequate water supply on such a high situation may be the reason, despite the great well 457 feet deep built by Jonathan Tyers and from which buckets of water were drawn to the surface by a circling horse (described in the 1890s by Stephen Tallents). However, the 1911 census includes “Landbarn” (at the bottom of the hill, towards Westcott) where William West is the “stationary engineer, pumping water to Denbies House”, presumably to increase the water supply. Two wings enclosed a service courtyard, with kitchen and bakehouse, workshops, lamproom, wine and beer cellars, storerooms, rooms for sharpening knives and forks, and for cleaning shoes. In freezing weather, the Estate workers collected ice from various local ponds (notably the reasonably adjacent Fox Pond) and loaded it onto carts to pack into the depths of an icehouse 20 feet deep and 15 feet in diamater. Its roof formed the floor of the game larder which often held 300 brace of pheasants. 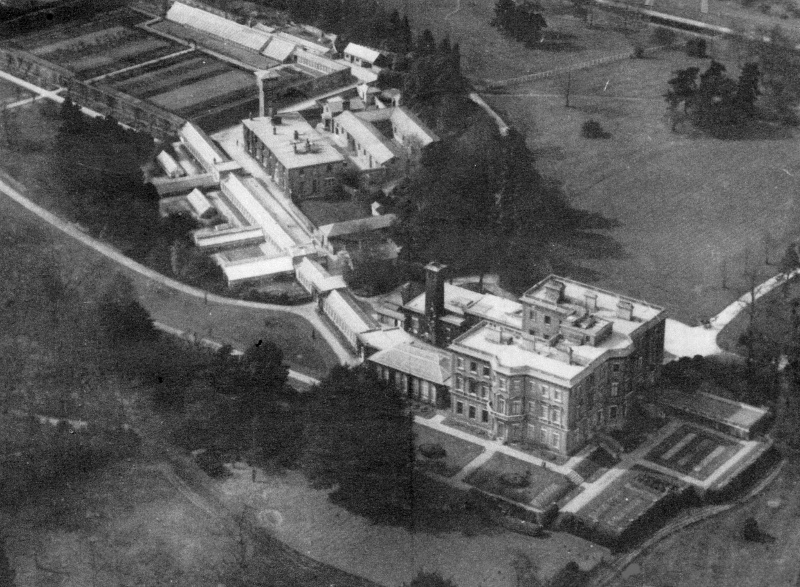 Separate from the house were the laundry and stables (the three parallel buildings near to the centre top of the photograph below), and the extensive kitchen garden can be seen at the top left. Such a mansion required a large number of servants. Between the Wars, long after Thomas’s time, there were still around 25 indoor staff. Females included a cook and a housekeeper, under cook, 1st, 2nd and 3rd kitchen maids, scullery maid, head housemaid, five under housemaids, linen maid, dairymaid, and a daily. 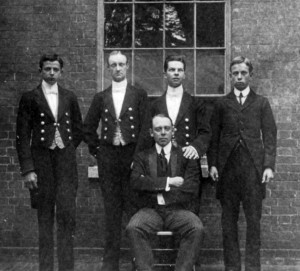 The male staff were a head butler, under butler, three liveried footmen and a hall boy. There was a traditional Servants’ Hall, and the butler, cook and housekeeper each had their own rooms. 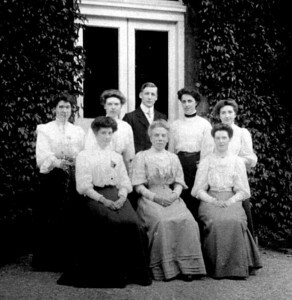 Lady Ashcombe and her staff about 1910. The butler is Charles Boxall. Mabel Hedger on the extreme right is the “Aunt Mabel” whose photograph album is the basis of much of the Ranmore Archive (whose copyright this photograph is). Outside staff included two chauffeurs and a boy, a retired coachman who looked after an old mare and the gig, head gamekeeper and two under gamekeepers, garden staff and about 40 Estate workers. To the west side of the Mansion was the Engine House, with a diesel generator – there was no mains electricity until 1953 – not long before the house was demolished ! Before the generator, in Stephen Tallents’ day, the house was lit by numerous oil lamps, with an old man whose job was to light and maintain them. The large stables contained a string of plump horses, mostly bays, each in his own spacious quarters with his name painted on a board. 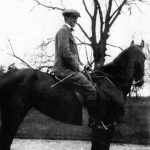 There were many fine horsemen among the Cubitts and their staff, although this gentleman in the photograph from “Aunt Mabel’s Album” is unidentified (Ranmore Archive). In Stephen’s boyhood, the pride of the stables were Max and Ben, a handsome pair of stately greys who pulled the Cubitt barouche through the gate of the stableyard and round to the portico outside the front door. They would then take George, Lord Ashcombe, and his wife Laura on a sedate round trip, down the mile-long Dorking Drive, through the town, and back up the longer Mickleham Drive. The coachman was splendid in a cockaded top hat, maroon coat with crested golden buttons, white breeches, and shiny top boots. The coach house boasted horse-drawn vehicles for all occasions, from smart (the barouche, landau, two broughams, phaeton) to practical (two waggonettes, brake, a shopping cart and a pony cart). The Estate also boasted a splendid horse-drawn fire engine which lived in its own building at the north end of the stable block. It was hand pumped by a long bar on either side. Hanging on the walls were a set of blue firemen’s uniforms, complete with axes and gleaming brass helmets. 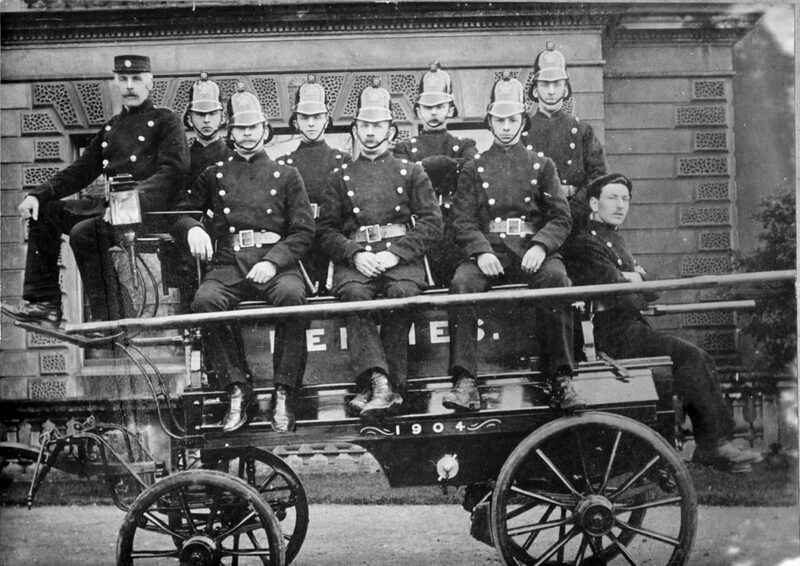 Denbies fire engine and crew in 1904 (Dorking Museum). One wonders how many of these men fought, and maybe died, in World War 1? According to Ernest R. Baker, brother of the World War 2 casualty Edward George Baker, the changeover from horses to cars was made around 1912. Ernest worked as bicycle boy and third chauffeur, doing the house shopping in Dorking and acting as general runabout. 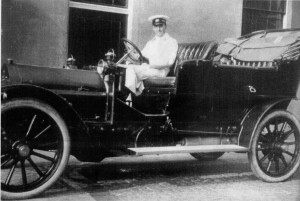 During WW1 he was in France, serving as a driver (see They Also Served WorldWar 1). For more information on the Gardens, farms and Estate cottages, see Denbies Gardens and Life and Work on Ranmore Common. The Church, School and Rectory are given greater detail on the page on St Barnabas, and there is information on Denbies Fort (also home over the years to several Estate workers and their families). To see approximate locations of the cottages and other buildings, see the Sketch Map of Ranmore Common. After WW1 much changed on the Estate, but some things remained the same: in matters of etiquette (according to Sonia Keppel, later married to Roland Cubitt) women had to wear elbow-length white gloves at dinner, and Maud, 2nd Lady Ashcombe, was resolutely against the more relaxed modern manners. However, death duties after George, lst Lord Ashcombe, died in 1917 led to the 1921 sale at the Red Lion Hotel of outlying portions of the Denbies Estate in and near Dorking (including Sondes Place), meadows and ground rents. Many of the cottages were bought by existing tenants. 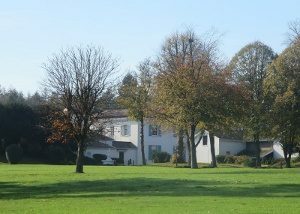 The sale of the properties and 261 acres raised over £30,000. After 1926 a middle-class housing estate was built on the lower slopes of the hillside (on, and near, Ashcombe Road). Despite this necessary belt-tightening, Denbies House still was able for a long time to support an indoor staff of 24 servants. However, there were even more crippling death duties after Henry, 2nd Lord Ashcombe, died in 1947, not to mention the difficulties of maintaining such an enormous house in changed times. Servants were hard to find; rationing and other restrictions made life very difficult. 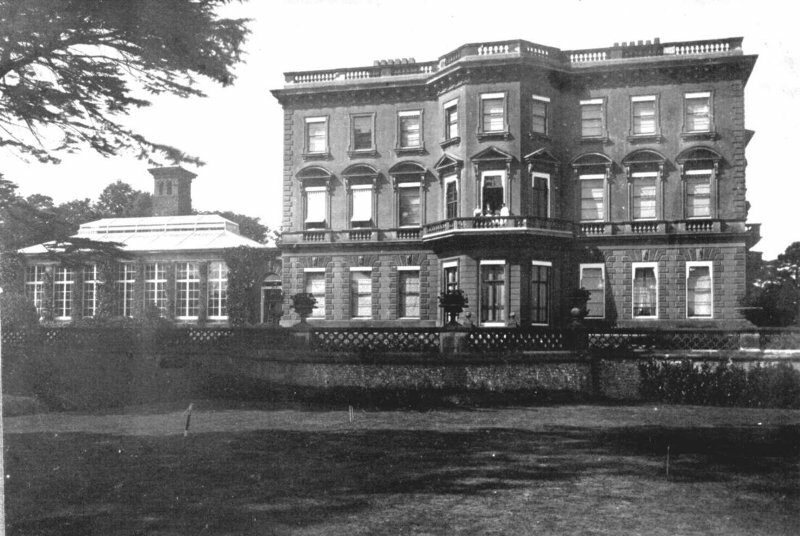 So in 1953 Roland, 3rd Lord Ashcombe, decided reluctantly to demolish his great-grandfather Thomas Cubitt’s house and glasshouses that had been in existence only a hundred years. Denbies Mansion was replaced by a smaller but still splendid house converted from the old laundry and stables. Lord Ashcombe lived there and farmed the Estate until his death in 1962. Subsequently, in 1984 his son Henry, 4th Lord Ashcombe, moved to Sudeley Castle, Gloucestershire, when he married its chatelaine, and the remnants of the Estate and the house were sold to (Sir) Adrian White who set up the extensive vineyards of Denbies Wine Estate.